Editor's note: Mark Hopkins' Living in Emergency: Stories of Doctors Without Borders opens in theaters June 4 through Truly Indie. What follows is an interview we conducted with Hopkins last summer when the film was featured as part of IDA's DocuWeeks Theatrical Documentary Showcase. Over the past few weeks, we at IDA have been introducing our community to the filmmakers whose work is represented in the DocuWeeksTM Theatrical Documentary Showcase, currently running through August 20 in New York City and Los Angeles. We asked the filmmakers to share the stories behind their films--the inspirations, the challenges and obstacles, the goals and objectives, the reactions to their films so far. in Emergency: Stories of Doctors Without Borders..
Synopsis: For the first time in its history, a film crew has been allowed access to the field operations of the world largest medical NGO--Doctors Without Borders. Filmed in the war zones of Liberia and Congo, Living in Emergency follows four volunteer doctors as they struggle to provide emergency care in extreme conditions. Amidst the chaos, each volunteer must confront the severe challenges of the work, the tough choices and the limits of their own idealism. natural thing to do, to get out there and start shooting. IDA: What inspired you to make Living in Emergency: Stories of Doctors Without Borders? presented a great vehicle through which to unravel this particular myth, while delving into an intense and fascinating world--inadvertently contrasting the "do-gooder" assumption through an immersion into the lives of the real people actually on the humanitarian frontlines, aware of their limits, the limits of their work, and the overwhelming challenges they face. consistently described as one you must live to understand? It was an all-consuming challenge that we spent next two-and-a-half years attempting to meet. MNH: We had drawn up a fairly detailed structure going in: a narrative framework based not on individual character arcs, but constructed from multiple characters embodying different stages of the overriding story arc of a field mission. The idea was to experience the changing perception of life in the field that's undergone by a first mission: They start out with a surface understanding and gradually absorb the greater complexities of field existence as time goes on. It's the audience's symbolic first mission, as it were. Within this structure, the veteran characters serve as a contrast, providing an experienced voice that helps move the understanding of the first-timer forward. We had expected these voices to still have at least a veneer of the "do-gooder hero" myth, but there was none. Without exception, anyone with a decent amount of field experience had a completely unvarnished understanding of their work and its overall significance. In hindsight, it seems fairly obvious--the people picking up the bodies in the face of overwhelming need will be the least delusioned about their role--but at the time it came as a surprise. It meant this veteran voice provided even greater contrast and complexity to the first-mission experience. 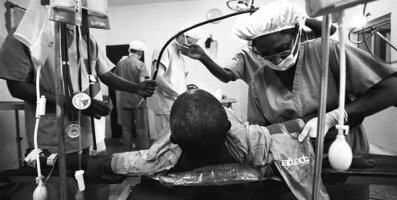 IDA: As you've screened Living in Emergency: Stories of Doctors Without Borders-whether on the festival circuit, or in screening rooms, or in living rooms-how have audiences reacted to the film? What has been most surprising or unexpected about their reactions? MNH: It's been a humbling experience, from our opening in Venice to the most recent festival in Munich. As described above, the structure of the film is built around the conceptual journey of a mission, and is designed to immerse an audience in the field. It would be disingenuous to this field reality if this experience were not something of a challenge, and it's extremely rewarding to see the audience rise to the occasion--moved, engaged, compelled, thinking through the ideas. global health--continue to work, individual by individual, in the face of insurmountable need. MNH: Mark Harris, an insightful and tremendous mentor to this film; Deborah Dickson, always illuminating; Werner Herzog, with his innate curiosity; Errol Morris...the list goes on. And films: One Day in September; Capturing The Friedmans; General Idi Amin Dada; The Fog of War; Hearts of Darkness...again, too many to list. Living in Emergency: Stories of Doctors Without Borders will be screening at the ArcLight Hollywood Cinema in Los Angeles and the IFC Center in New York City.